What is an 'order book'? An order book is an overview of all current buy and sell order of a specific cryptocurrency. They are arranged by price levels. Consequently order books show at each price level all current bids and orders for the cryptocurrency. Order books are therefore an essential short-term trading tool. For longterm traders and HODLers it is no very beneficial. The following infographic helps you to fully understand order books. On the left, green side all buy orders are positioned. 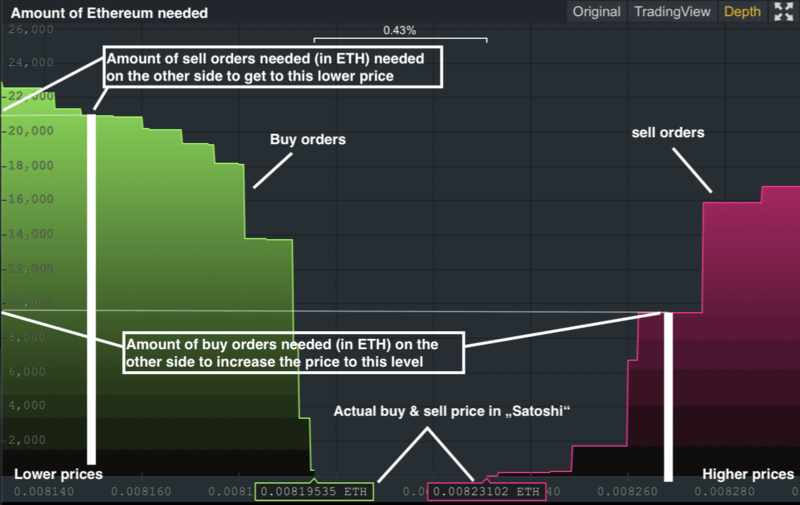 On the right side, the sell orders are displayed. The x-axis shows the price in Satoshi, increasing from left to the right. The y-axis is showing the amount of Ether offered at all price levels. In effect this means e.g. to increase the price to the level chosen on the x-axis in the graphic below (right side) you see on the y-axis the amount of Ether required to reach that level.